Where does the trolley run? Do you call it or is there a route? 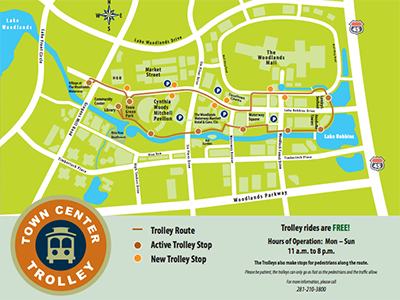 The Woodlands Waterway Trolley is free of charge and goes on a designated route around the Town Center area, stopping at major points of interest. The Trolley operates Monday-Saturday, 11 a.m.-8 p.m., and Sunday, noon-6 p.m.